The Former Mikami Family Residence (The Old Mikamike House) which was operated under the commercial name “Mottoiya” is an old mercantile house that was previously used as a sake brewery, thread manufacturer, and a small cargo vessel industry. The merchants stationed in the house operated two commercial vessels as a part of the “Kitamaebune” cargo industry that sailed along the trade route between Hokkaido and Osaka. The main building of the house was originally constructed in 1776 and then burned down and was reconstructed in 1783. The other parts of the house were added on between the years 1830-1838. At the time of reconstruction, the outer walls of the building were whitewashed to prevent fires. The building itself is registered as an Important Cultural Property by the Japanese national government and the garden is registered as an Important Cultural Property by the Kyoto prefectural government. In the house, visitors can see the tools previously used to make Japanese sake, classic Japanese craftsmanship and interior decoration, and displays of old household tools such as irons and sewing machines just to name a few. The house is well maintained and open to tourists year round with guides available for tours. 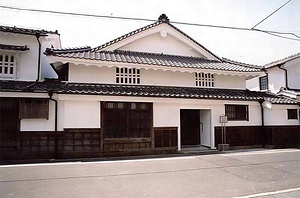 The Former Mikami Family Residence, which until recently operated as a sake brewery, is a very useful tool to understanding the Japanese sake making process. Japanese sake, unlike western wine which is made from grapes, is made from rice. This being said, the fermentation process is more complicated and involves more steps than that of wine. In the wine-making process, grapes, which are mostly sugar, are the main ingredient. Thus, the yeast is used as an agent in the fermentation process to turn the sugar into alcohol. However, when rice is the main ingredient, there is an extra step in which the starch must first be changed into sugar using koji mold (Aspergilus oryzae) as an agent. The remnants of the Edo period Japanese class system are apparent in the house’s architecture. There are two entrances to the house: a regular gate and a gate for noble class visitors. Merchants were not normally permitted to build gates like the one at the Former Mikami Family Residence; only samurai were allowed to have these gates as an entrance to their homes. However, the Former Mikami Family Residence was also used as an inn for noble guests including members of the royal family when they visited the area and so the construction of the gate was permitted as it was necessary to welcome these high class guests. The tea room also has two different entrances. One is a very small square shaped entrance that a person would have to bend over in order to enter through. The other is much larger and rectangular shaped so that noble guests could enter without bending over. There was also a special bathroom said to have only been used by four people (noble guests) separate from the bathroom that the other families used. There is also a room whose interior is decorated with elaborate craftsmanship used to entertain the noble guests while others enjoyed tea ceremony in the tea room. From this room, the garden can be viewed and enjoyed. 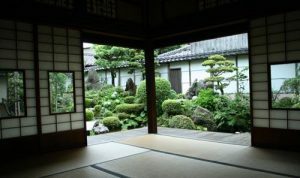 Gardens were also traditionally not allowed to be included in the design of mercantile houses until the Meiji period at which point the class system was no longer in effect and the merchants and laymen became wealthy enough to afford their construction. However, this house was permitted to have a garden for the purpose of entertaining guests as an exception. The garden was designed to be viewed from a sitting position. This style is called zashikansho in Japanese. The garden incorporates many elements including those of the surrounding landscape. This concept of incorporating elements from the surrounding landscape into the garden and harmonizing them is called shakkei. The garden is filled with Japanese vegetation and stone decorations including a rock that natural formed in the shape of a lion’s head. The pond of the garden is also home to over 30 turtles. The two largest turtles are named “Mika-chan” and “Kan-chan” after Mikami Kanbee who founded the Mikami Family Residence. The turtles are trained to poke their heads out of the water and come onto the shore to seek food when they are clapped for. So, if you are interested in seeing the turtles please try clapping your hands. One of the pieces of craftsmanship that is characteristic of the house are the nailhead covers (aka; nail hiders). These are decorative artistic pieces that cover the nails in the construction so that they cannot be seen and add an artistic touch to the design. The patterns used for the nailhead covers are different in each room but include peaches and chestnuts among many others.